Kinesio Tape is a super thin athletic tape, about the same thickness and the elasticity of skin and muscles. Kinesio Tape is made of a porous cotton fabric with a medical grade acrylic adhesive that allows the skin under the tape to breathe and be cleaned while showering. Kinesio Tape uses a special method of adhesive application combined with the porous nature of the fabric works 'with' your body. The Kinesio taping method provides a full range of motion, support, and stability, without adversely affecting the natural range of motion. Kinesio tape is designed for a 30-40% longitudinal only stretch and when applied, it lifts the skin and provides support for surrounding soft tissue. This Kinesio Tape is LATEX FREE and NON-MEDICATED. Kinesio Tex Tape was designed to be worn for 3 to 4 days without irritation; and an hour after application it will withstand athletic activity and showering without coming off. The water resistant type of taping Kinesio offers is necessary for the taping of hands and feet. Proper application does not require multiple layers; due to location of muscles, an application may cross over another application. What Does Kinesio Taping Do? Kinesio Tape gives support and stability to your joints and muscles without reducing circulation and range of motion. It is also used for Preventive Maintenance, Edema, and Pain Management. It is a taping technique based on the body's own natural healing process. This Kinesio Taping exhibits its efficacy through the activation of neurological and circulatory systems. This method basically stems from the science of Kinesiology, hence the name "Kinesio". Muscles are not only attributed to the movements of the body but also control the circulation of venous and lymph flows, body temperature, etc. Therefore, the failure of the muscles to function properly induces various kinds of symptoms. Consequently, so much attention was given to the importance of muscle function that the idea of treating the muscles in order to activate the body's own healing process came about. Using an elastic tape, it was discovered that muscles and other tissues could be helped by outside assistance. Employment of Kinesio Taping creates a totally new approach to treating nerves, muscles, and organs. The first application of Kinesio Taping was for a patient with articular disorders. For the first 10 years, orthopedists, chiropractors, acupuncturists and other medical practitioners were the main users of Kinesio Taping. Soon thereafter, Kinesio Taping was used by the Japanese Olympic volleyball players and word quickly spread to other athletes. Today, Kinesio Taping is accepted by medical practitioners and athletes in Japan, United States, Europe, South America and other Asian countries. How is Kinesio Tex Tape Used? The Kinesio Taping Method is applied over: muscles to reduce pain and inflammation, relax overused and tired muscles, and to support muscles in movement on a 24hr/day basis. It is non-restrictive type of taping which allows for full range of motion. In contrast, traditional sports taping is wrapped around a joint strictly for stability and support during a sporting event obstructing the flow of bodily fluids... an UNDESIRABLE side-effect. Kinesio Tape is used for anything from headaches to foot problems and everything in between. Examples include: muscular facilitation or inhibition in pediatric patients, carpal tunnel syndrome, lower back strain/pain (subluxations, herniated disc), knee conditions, shoulder conditions, hamstring, groin injury, rotator cuff injury, whiplash, tennis elbow, plantar fasciitis, patella tracking, pre- and post-surgical edema, ankle sprains, athletic preventative injury method, and as a support method. Easy To Use. Promotes Healing. Safe. Effective. Long Term Use. Keep In The Medicine Cabinet. Quick Fix. Emergency Preparedness. Outdoor Activities. Novice First Aid Skills. Parent. Great for very active growing kids who play high level sports. Easy To Use. Safe. Effective. Keep In The Medicine Cabinet. Long Term Use. Outdoor Activities. Emergency Preparedness. CPR Trained. flat footed. has foot & ankle injuries. I'm no stranger to chronic foot pain--I have flat feet and have suffered multiple foot &amp; ankle injuries, including sprains, severe fractures and completely disrupted ligaments. KT goes exactly where I want it and only where I need it. I can leave it on for several days, and I don't need to readjust it or worry about getting wet it. It doesn't make me itch or sweat, nor does it restrict my mobility. I can wear any shoes I want with KT, and cover it with socks or tights as needed for work. After my first use of KT, this is the first time in years that I've spent all day on my feet without being in pain at the end of the day and the next day as well. HINTS: Watch several online tutorials demonstarting your desired application, then choose the one you like best. Leave the backing on and practice the layout before applying KT. Use multiple colors of KT to help make sure you wrap your injury correctly. If the KT's edges lose their sticky, a bandaid will hold them in place. Promotes Healing. Effective. Lessens pain. Keep In The Medicine Cabinet. Long Term Use. Outdoor Activities. After surgery. After surgery. outdoor sports enthusiast. Novice First Aid Skills. Parent. After surgery repairing my rotator cuff and bicep I was unable to keep any pain medication down. Once my wounds were cleaned and the Kinesio Tape was applied, my pain was reduced by probably 50%, no joke! I love this stuff! Promotes Healing. gives enough support for . Difficult to Use. learning curve to apply. Long Term Use. helps you move better. watch the videos on you tube to learn the application. Keep In The Medicine Cabinet. Long Term Use. I use to help alleviate stress on muscles in my back , shoulders, and arms. by Carol from Vidor, tx. how many comes in a bulk package or a box? we have used Kinesio tape for my daughter with CP and it helped greatly with her posture. However, she is allergic to the material in tape and would break out as soon as we removed it. Is there a Kinesio tape made of a different fabric? Are you sure it's the tape & not the adhesive itself? You could test this by placing a area with the adhesive covered (or folded on itself) & held in place with cloth or some material you know she doesn't have an allergy. Wait about a half hour & see if there's a reaction. Good luck! 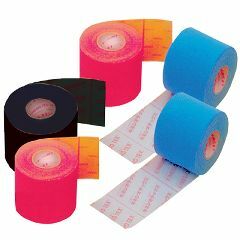 I did not notice ANY different in the colors of the tape(s) when used on my post-surgical knee repairs. Result & pain relief was equal with 3 different colors (beige, blue & black). Good luck!! How do you tape tennis elbow? Asked on Jan 20, 2014 7:54:46 AM by Tony from Malvern, Pa. There are some great youtube videos on how to tape different injuries. I used them to tape a knee injury and also my own golfers elbow. I would like to use this on a a nagging right groin strain. Is it good for this and how would I apply this for groin problems? Thanks. i have lymphedema in my right arm. my problem is mostly in the elbow area. how would i tape this section? does the color of the type matter? thanks. Asked on Jul 25, 2013 9:16:14 AM by arlene from long island, n.y. I don't believe that the color makes any difference. Personal preference I believe. While playing racquetball I strained a muscle on my right back side in the kidney area. Can I apply a Kinesio tape in that area to relieve the pain while playing? How does it work for lymphedema? Does the tape lessen pain from inflammation? touch travels faster the pain so if something is sitting on the skin giving the skin signals when the joints move,etc. the signal on the skin travels faster then then pain signal to the brain and blocks some of the pain perception. and when it reduces the inflammation, then it also decreases pain by decreasing the signal on the pressure sensitives nerve receptors. i hope that answered your question. Can I use Kinesio tape to support calf muscles? If so, how do I place the tape? Where do I find 1/2 inch paper tape made by McKesson? I have a rotator cuff injury, would this product (Kinesio Taping) help me with the pain and speed up recovery. I am seeing a PT but my next appt. is in 3 weeks. Yes, not only will it help stabilize your shoulder, it will reduce pain and inflamation while helping with range of motion. This is exactly what I use Kinesio tape for. I can play golf several days in a row if I use the tape. If I don't my shoulder is too sore after the first day. As far as recovery is concerned, I doubt the tape will cause even a slight rotator cuff tear to heal, however if your shoulder is merely strained, the tape should prevent reinjury. Would kinesio tape help with lymphatic drainage to prevent swelling of top of foot and ankle? Seems to creat channel for the lymph fluid to flow back on. I have lymphedema in my right arm, I love this tape. I used bandages and the tape, I had great results! This was the first time I placed an order with AllegroMedical.com. I was very pleased with how quickly my order was processed as well as the emails letting me know the status of my order. My purchase was for needles for b12 injections. I highly recommend Allegro Medical. This is my second time buying your product it is remarkable and amazing. I would recommend it to everyone that's in need of the product.